The TK-Pet coolpad for pets is the perfect accessory for your pet is comfortable during the hot months. It ensures their welfare as it is designed to reduce the body temperature of the animals and can be cool on hot days. Its use is very simple and it works contact: just extend the cushion in a dry place and avoid getting radiation from the sun. When your pet to lie on top, gently push a portion of the cushion and without occupy all, begin immediately to reduce your body temperature giving a more pleasant thermal sensation. It is a very safe and practical accessory because it has no wires or batteries. The filler is composed of a material which ensures that the mat is kept cold for hours without using any power supply and without having to refrigerate previously. Reduces the thermal sensation of your pet and this cold effect lasts several hours. To reuse just you have to let it sit to automatically recover their properties due to its components. The outer fabric is made of PVC, which is very convenient and comfortable for your pet. In addition, it is a foldable and compact size for easy placement and transport object. You can bring the cooling pad to any room of the house: extend it on your bed or in the place of the house you prefer. It is also a very hygienic thanks to that repels water and dirt accessory, and is very easy to clean. The material which is manufactured is inorganic salt, polymer and water. 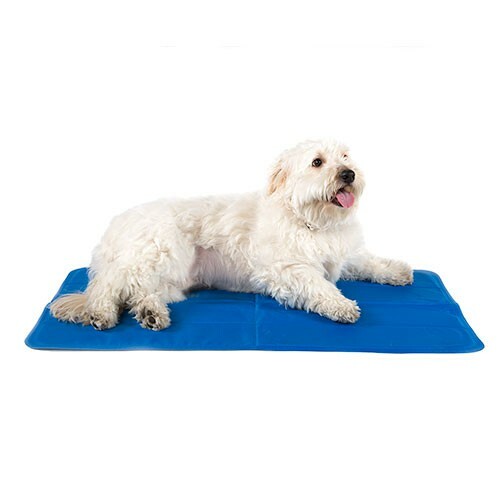 This produces a pleasant cooling effect that will relieve your pet and offer a very pleasant break. Your body temperature is maintained by preventing increases and you may suffer heat stroke can be dangerous and likely coated by lots of fur animals. With this cooler pad you will improve the quality of life. It reduces body thermal sensation. Contact works without batteries or cables. The cold effect lasts several hours. Cooler for the rest of pets that lowers your body temperature providing a thermal sensation cushion. Contact operation, no cables and no need to refrigerate. Extends the cushion in a dry place avoiding solar radiation for your pet to lie down and then start to feel the cooling effect. After a few hours of use, let stand for one hour to retrieve their properties automatically. Do not keep it near sharp objects that could damage it. In case of crystallization, slightly massaging pad across the surface until the gel back to its fluid state. It is not a product designed to be bitten. Use under supervision. Clean the surface with soapy water. PVC outer fabric and filler made of inorganic salt, polymer and water. Finally your pet will enjoy you summer with its refreshing cushion that can take you anywhere.